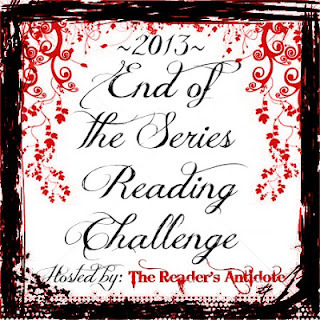 This challenge is being hosted by Nicole @ The Reader's Antidote. What are the rules of this challenge? Your goal is to read seven (7) books that are the final ones in the series that come out and that you have read in 2013. To participate, you need a blog or a Goodreads account. Your reviews need to be written in English. I'll likely write up a post at the end of each month (or every three months, I haven't decided yet) where everyone participating can link up their reviews for these books and we can all check them out! What books are on the EotSC list? The final book published in a YA series by an author in 2013. It has to be in a series, not an author's third or fourth standalone, etc. I have made a Goodreads group for this challenge, which has a list of books that I believe will count for the challenge. This list may not be accurate as the publishers may not have announced that there is another book in the series yet. If there is an error, I will delete the book and that book will not count for the challenge anymore. I know this is slightly haphazard but hopefully it won't be too much of a problem. Why should you join this challenge? Because it's awesome? One of the best things is the final book in a series. This is what it's all come down to. It's the ending of a journey that you've waited at least a year to finish, and this is your chance. One of the reasons I wanted to do this challenge is that I know some people hold off on the final books of the series because they don't want to see it end. This is to push you to that end. Any books read from January 1st, 2013 - December 31st, 2013 count for this challenge. This means that if you read the final book in a series before January 1st or after December 31st, then it doesn't count. This also means ARCs that you may have already read this year. What should you do if you're an author coming out with the final novel in your series? I would love to feature your book on the challenge list! Just make sure it fits within the rules of this challenge. Please e-mail me [mainardi(dot)nicole(at)gmail(dot)com] or comment on the group page and let me know if you want your book put on the list. Holy Moly! Another challenge?!? How ever are you going to find the time lol? Good luck!